The art of preserving leaves dates back to when botanists traveled the world in search of new plant species. They needed some way to preserve the specimens on site for further studies when they got back to homeland. When they pressed the flowers or leaves, they'd get very brittle and discolored. However, with wax paper and an iron, you can preserve leaves that will last almost indefinitely. Look for leaves that are still fresh. If collecting autumn or fallen leaves, stay away from those that are crumbly and papery, as these will break apart extremely easy and be destroyed by the heat. Fresh leaves that are still soft and moist will last indefinitely. Consider thickness. Thick leaves, like large succulents, have to be ironed around the leaf design to create a seal around them, not directly on them. Smaller thick leaves (like croton or magnolias) should only be lightly ironed, or not at all, to prevent crushing and breaking. Also consider ironing only the edges or tips of the leaves. Experiment with the techniques that follow, depending on which leaves you pick. Include stems, if you'd like. 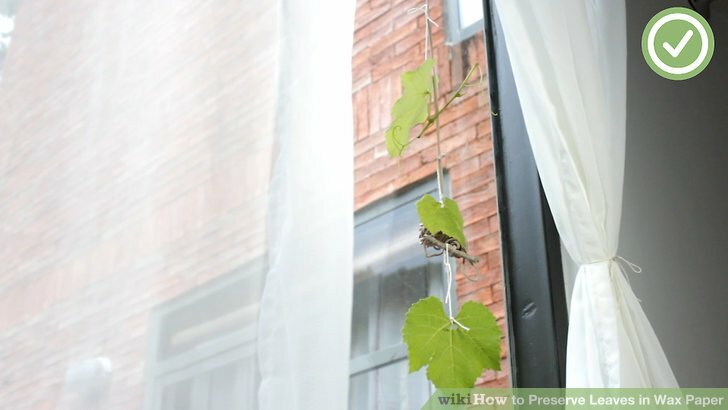 Whole stems and branches can be preserved this way simply by ironing the leaves and not the stem. If the stem is herbaceous and soft just iron it like a regular leaf. Separate out leaves if they form in a mound. 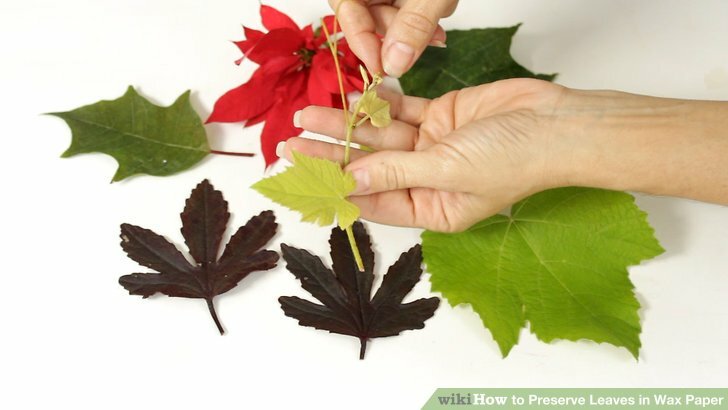 Some leaves (and flowers like poinsettias that are like leaves) form in a high mound which is too thick for this technique. Dissect the cluster and arrange the individual leaves in a flat design, instead. Avoid leaves with very hard thorns which will tear the wax paper. Some plants, like Thistles, have spines which are not hard but bristly which are suitable. Many spiny grasses and plants, like pineapples, are spiny but flat like a knife, which also is good for this project. Others, like aloes and many spiny succulents, are not suitable. 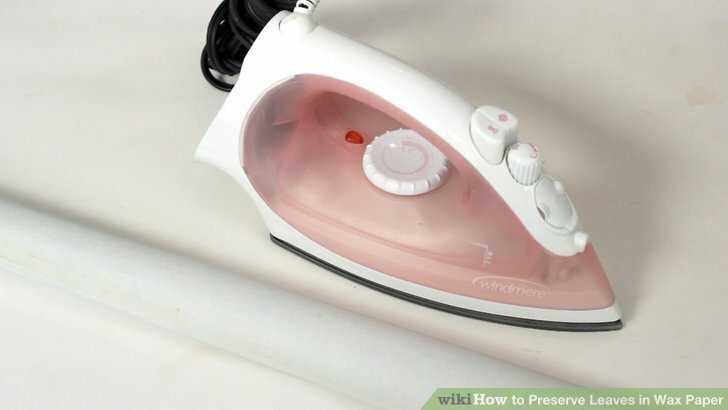 Obtain wax paper and an iron. These are very inexpensive and easy to find. Gather anything else you might need. 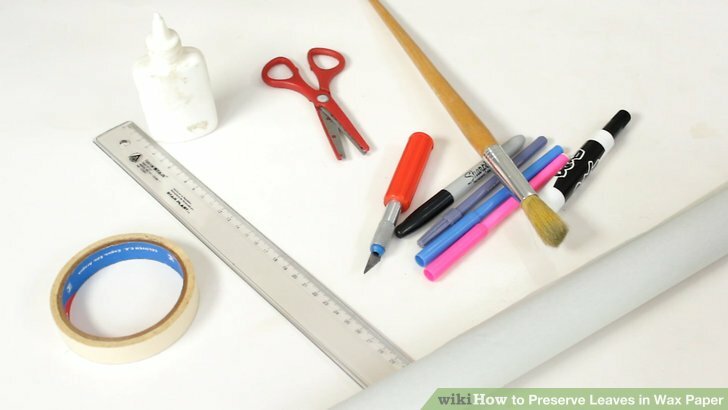 You might want markers, frames, labels, paper for labeling and crafting, and any other craft items for displaying or crafting with the finished project. 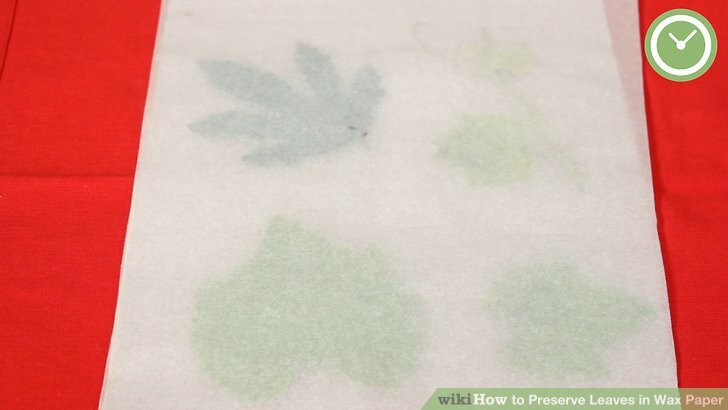 Place the leaves in between two sheets of wax paper, with the waxed side facing inside. If you place the waxed side on the outside, the result will be a waxy, sticky, mess on anything it touches. The waxed side will have a slick slightly sticky feel like a crayon drawing. The non-wax side is smooth and even. Don't be afraid to get creative with designs and arrangements for the leaf display. Iron the leaves and wax paper "sandwich" on a low setting. Work in one direction with slow, even strokes. This will help avoid air bubbles and uneven areas. For thicker leaves, like oaks, let the iron stay on one spot for a few seconds. The paper will turn from translucent to slightly transparent, and the leaves will flatten and may give off a leafy smell, depending on the species. Let the project cool off and set before handling. If you try to handle it too soon, the wax will have no time to cure and it'll probably peel apart. Also, it will too hot to handle. Let it cool and the wax will form a barrier and soak into the leaf tissues to preserve it. Mount your finished piece in a picture frame as a work of custom art. Just frame it up like a traditional painting. The result will resemble the ones in interior decoration boutiques that cost hundreds, if not thousands, of dollars. Display a collection of leaves in a binder or art folder. Get a nice office binder and sturdy paper. Use office plastic sheet protectors, white printing paper or card stock and tape the pressed leaf project onto the paper. Use labels to keep track of species, locations, dates and other notes. These waxed leaves also can make excellent scrap-booking materials. Use your leaves as ornaments. Poke a hole or punch in an area of the preserved leaf that has no air pockets. Dusty miller and other silvery plants make really attractive "snowflake" ornaments. Don't display the leaves in full sun or they will either fade or get scorched. 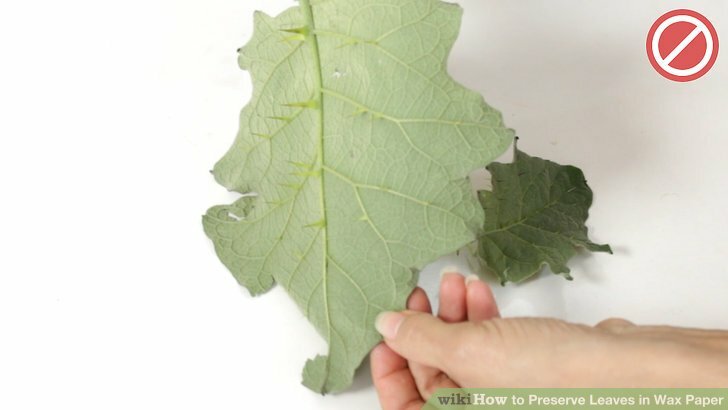 Remove or shave down very thick and hard stems (like the bottom of an old leaf of kale), so the rest of the leaf will lay flat for the project. Keep leaf projects out of direct sunlight to prevent scorching and discoloration. Keep away from direct heat. If the wax paper is not waxy enough, get a white paraffin wax candle and rub it on the leaves or on the paper. Don't just consider leaves of trees for this project. Look around at all the amazing shapes of leaves in flowering plants, vegetables, and weeds. If a favorite houseplant has suddenly lost its leaves due to illness, consider saving those leaves for decoration or as a reference. Simple flat flowers, individual flower petals and flowers that are like leaves can be preserved this way as well. Examples of leafy flowers are poinsettias, orchids, heliconias, anthiriums, sweet peas. Remove thick non-petal parts first. There are many color stages of the development of leaves, especially in autumn ones like maples and red oaks. These can be really fun to try to collect for one collection or design. The same goes for the shapes of leaves as they mature or vary in age, particularly for species like kale greens. Don't iron the leaves at too high a setting or iron the project too long. Wax and leaves will burn. Some plants are poisonous; do not eat or touch those! Also some have flammable sap that can catch fire or emit fumes. Be sure leaf collecting is allowed on the property or of the species. It's illegal to collect leaves and flowers of an endangered species. Also neighbors and city parks may not want people collecting branch tips and living leaves off plants. Ask for permission first.